Today I have a secret recipe for a discontinued menu item at A&W. A&W is well-known for its classic all American food. The whistle dog is a split hot dog that’s grilled and topped with crispy bacon, Cheddar cheese and sweet relish. A trip to A&W is never complete without a root beer float, so make sure you enjoy a float at home when you enjoy this dog. Learn to Cook Chinese Food the Healthy Way. Slice hot dogs down the middle but not all the way through. Heat up the grill to medium and grill the hot dogs on both sides until nice grill marks appear. Toast the buns on the grill, open side down. Place one hot dog in each bun and fill the hot dog with cheese. Run it under a broiler to melt. Top with crisp bacon, relish and onion if desired. Dr. Oz recently featured a segment on green coffee beans and how they have been shown to inhibit fat absorption and also stimulate the activation of fat metabolism in the liver. In a recent study subjects who used green coffee extract lost an average of 17.5 pounds in 22 weeks and reduced their overall body weight by 10.5%! It’s hard to believe that the end of the summer is already rapidly approaching. 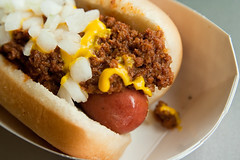 That doesn’t mean we still can’t enjoy some classic Coney dogs! Today’s secret recipe will show you how to make A&W’s famous Coney sauce. There is nothing better than a hot dog topped with this delicious slow simmered beef chili. Brown ground beef in very large skillet or pot ; drain. Add remaining ingredients and simmer for 3 1/2 hours. Stir frequently, as it will tend to stick. 1) Get Your Replacement In Cartridges At Extremely Low Prices! Order your printers replacement ink cartridges and toner at the lowest price available and have them shipped to your door. Combine mayonnaise and hamburger relish in small bowl; set aside. Form each portion of beef into a patty measuring 5-inches in diameter and ¼-inch thick. Place on waxed paper and freeze for at least one hour. When ready to cook, preheat grill. Toast buns by placing face down on grill and toasting for 30 to 60 seconds. If using an outdoor grill – 30 seconds; if using an indoor grill – 60 seconds. Place frozen beef patties on grill and cook 2 to 3 minutes per side (depending on whether you are using an outdoor or indoor grill.) Season patties on both sides with salt and pepper to taste. Place burgers on heel of bun. Top with cheese, lettuce, and pickles. Spread Secret Sauce on crown of bun and assemble. Wrap each sandwich in a 12 X 12-inch square of foil and warm in a preheated 200 degree Fahrenheit oven for 2 to 3 minutes, or place in microwave and heat for 10 seconds (wrapping in microwavable plastic wrap)– just long enough to warm the buns. Serve hot.